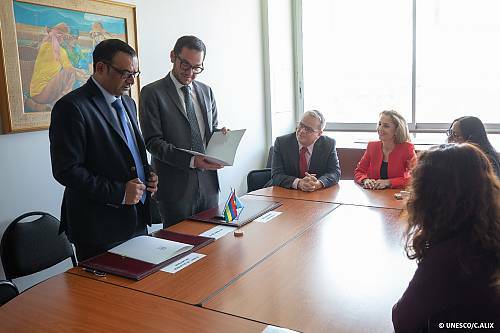 Following the decision of the Intergovernmental Committee last year to hold its thirteenth session in Port Louis, the Republic of Mauritius and UNESCO signed the host country agreement formalizing their cooperation and respective responsibilities for the organization of that session. The agreement was signed on 1st October 2018 at UNESCO Headquarters by H.E. Mr Vijayen Valaydon, Ambassador Extraordinary and Plenipotentiary of Mauritius to France and Permanent Delegate of the Republic of Mauritius to UNESCO and Mr Nicolas Kassianedes, UNESCO’s Assistant Director-General for External Relations a.i.. Mr Tim Curtis, Secretary of the Convention for the Safeguarding of the Intangible Cultural Heritage was also present at the signing ceremony. The thirteenth session of the Intergovernmental Committee for the Safeguarding of the Intangible Cultural Heritage will take place in Port Louis, Republic of Mauritius, from 26 November to 1 December 2018.